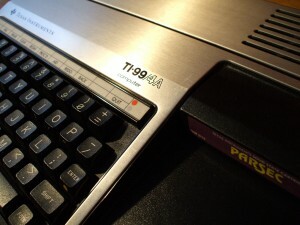 The TI-99/4A. Photo by flickr.com/quagmirez31. In the first grade I copied that line into my school’s TI-99/4A computer. I pressed Enter. It beeped! I tried changing the numbers to see what they did. The first was duration, the second, frequency, and the third, volume. What fun! I was supposed to be spending my time on a math tutorial cartridge, but the problems were too easy and I needed another challenge. My teacher had told me that using the computer without the math cartridge plugged in would break it. But what if she was wrong? When she wasn’t looking, I turned it off, pulled the cartridge out, and turned it back on. The computer greeted me: BASIC READY. I found that on that screen, instead of the computer telling me what to do, I could tell it what to do. I wondered if anyone else knew about that forbidden screen, because it seemed too good to be true. I was hooked. I’ve been telling computers what to do ever since elementary school. It’s how I make a living today. But when it came to music, I progressed only far enough to write a few simple songs in an MS-DOS program called Scream Tracker. After high school, I didn’t touch music for fifteen years. Now I’ve decided it’s time to focus on music again. So look out, world. I’m going to turn this thing on without the cartridge plugged in. Let’s see what happens. Does Your Western Digital Hard Drive Drop Notes?